Laura Kina is an artist and scholar based in Chicago, Illinois. She is a Vincent de Paul Associate Professor of Art, Media, & Design at DePaul University and identifies as “hapa, yonsei, Uchinanchu.” Born in Riverside, California in 1973 to an Okinawan father from Hawaiʻi and a Spanish-Basque/Anglo mother, Kina was raised in Poulsbo, Washington, a small Norwegian town in the Pacific Northwest. She received her M.F.A. in Studio Art from the University of Illinois at Chicago in 2001, where she studied with noted painters Kerry James Marshall and Phyllis Bramson. She earned her B.F.A. in Painting and Drawing from the School of the Art Institute of Chicago in 1994 and was inspired by her teachers Michiko Itatani and the late Ray Yoshida. Kina’s artwork deals with themes of distance and belonging, and her research is focused on Asian American and mixed race identity and history. Her artwork has exhibited across the United States and in India and Japan, including at the Chicago Cultural Center, India Habitat Centre, Nehuru Art Centre, Okinawa Prefectural Art Museum, the Rose Art Museum, the Smithsonian National Museum of American History, Spertus Museum, and the Wing Luke Museum of the Asian Pacific American Experience. Her solo exhibitions include Blue Hawaiʻi (University of Memphis Fogelman Galleries of Contemporary Art, Memphis, TN, 2014); Sugar (Woman Made Gallery, Chicago, IL 2010); A Many-Splendored Thing (Gene Siskel Film Center, Chicago, IL, 2010); Aloha Dreams (2007) and Hapa Soap Operas (2003) at Diana Lowenstein Fine Arts, Miami, FL; and Loving (Grand Projects, New Haven, CT, 2006). Her artwork has been published on the cover of Franklin Odo’s Voices from the Canefields: Folks Songs from Japanese Immigrant Workers in Hawaiʻi (Oxford University Press, 2013); Cathy Schlund-Vial’s Modeling Citizenship: Jewish and Asian American Writing (Temple University Press, 2011); and in publications including Other Tongues: Mixed-Race Women Speak Out, edited by Adebe DeRango-Adem and Adrea Thompson (Inanna Publications, 2010); Jillian Nakornthap and Lynn Stromick’s Embracing Ambiguity: Faces of the Future (Cal State Fullerton Main Art Gallery, 2010); and Staci Boris’s The New Authentics: Artists of the Post-Jewish Generation (Spertus Museum, 2008). My artwork is about themes of distance and belonging, and I focus on the fluidity of cultural difference and the slipperiness of identity. Asian American history and mixed race representations are subjects that run through my work. I start with autobiographical impulses and draw inspiration from popular culture, textile design, as well as personal and community photographic archives and oral history interviews. I collect these images, stories, and histories, and I see what is missing, what is not being told, what is not obvious, and I go hunting for it. I am interested in the overlap, fusion, disjuncture, or vibration that happens when I bring back the missing pieces and put them together. “Okinawa -- All American Food” and “Black Market” capture the remnants of war and a continued American military presence in contemporary Okinawa. Both paintings are from my Blue Hawaiʻi exhibition, which compresses time and space between Okinawa and Hawaiʻi. The exhibition is on view through March 27, 2014 at the University of Memphis Fogelman Galleries of Contemporary Art in Memphis, TN. To view the complete series and download the exhibition catalog visit http://www.laurakina.com/newwork2013.html. Set in present day Okinawa, Japan, the works are based on snap shots of in between spaces that I took on the way to meet my extended family and visit official tourist destinations. 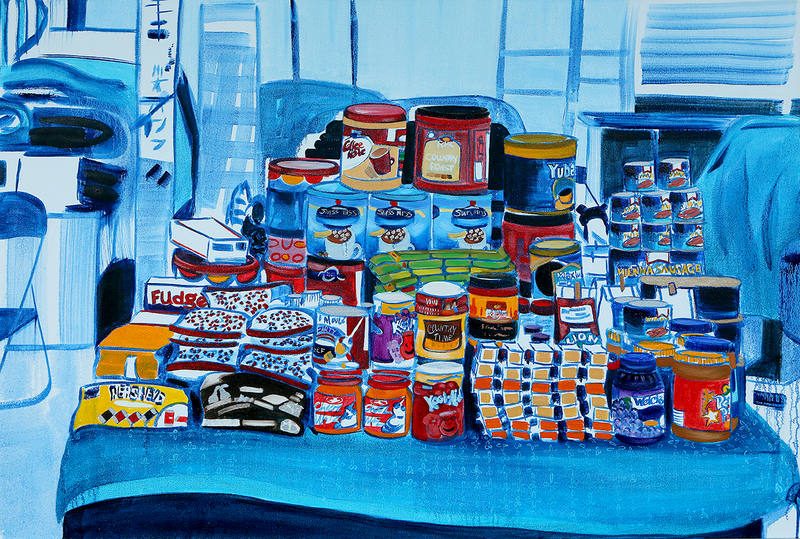 “Black Market” features a roadside black market where American processed food products from discounted US military exchange stores (e.g, BX, PX, NEX, MCX) are resold to locals. For many Okinawans, including my family, who grew up under US occupation (1945-1972), this junk food elicits a sense of nostalgia for their childhood. Products such as Spam, Vienna Beef, Dole canned fruit, and Folger’s Coffee, which may seem low brow at best in a US food world context, are viewed as markers of upward mobility. 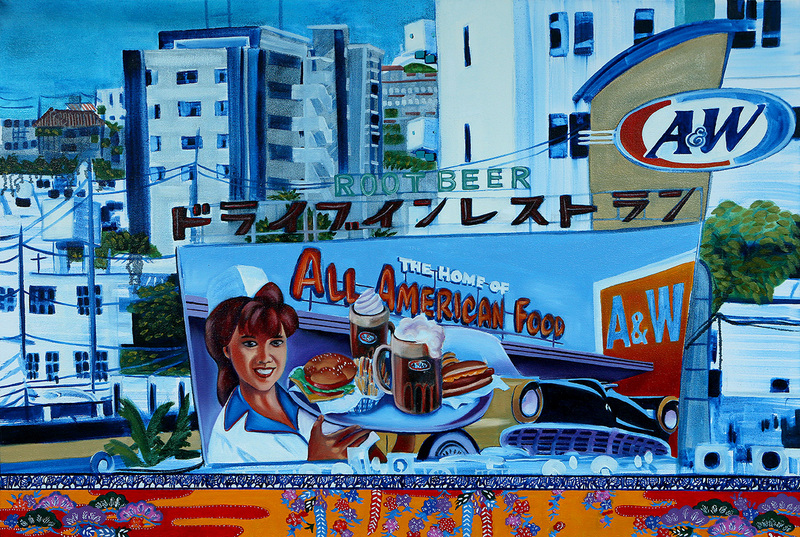 “Okinawa -- All American Food” captures an A&W billboard in front of a colonized urban Okinawan landscape in which power lines scrape across the sky and the view is crowded with cement apartment buildings and only one traditional red ceramic tiled roof can be seen in the distance. The A&W mid-century carhop waitress offers up a platter of American food: hamburger, hot dog, fries and two root beer floats. The billboard references the ongoing impact of the post-World War II years. In the foreground a painted strip of brightly colored bingata fabric points to the independent Ryukyu Kingdom and courtly dancers, which are presently reduced to a tourist framework and relegated to the ancient past. Rachel Ishikawa, CA+T Interviews Laura Kina, July 9, 2014. 2013 Oil on canvas. 30 in. x 45 in. Courtesy of the artist.